I almost spent $10,000 to impress a girl. Almost. Three years ago last month in June 2009, I proposed to my wife. From idea generation, coming up with a strategy, drafting a plan of attack, setting priorities, scheduling, budgeting, all the way to the execution and implementation, the entire "operation proposal" took several months and lots of brain juice. I wanted it to be special, I wanted it to be fun, and I wanted it to be something we could talk about for years to come. Problem: I sneakily poked around the idea of going bungie jumping to my fiancee-to-be, and quickly realized the problem with the plan. The likelihood of anyone saying yes to any type of proposal drops significantly when under stress. Bungie jumping isn't something she was particularly excited about, and I could already imagine her saying no a whole lot during the bungie jumping before I even asked the question. This idea had no future. We lived in Toritsu Daigaku, which is about 10-15 minutes west of Shibuya on the Toyoko train line. The plan was to rent out all of the ad space in a carriage - the area above the head on the side of the carriage, and propose on the train while we were commuting into the center of the city. Problem: Even though I was really excited about this idea, I quickly found out a huge hole in this plan before I even started looking into how to do it. If everything went to plan, I would surprise her on the train with pictures of us plastered all over the carriage, she would say yes, people around us would clap their hands, it would be great. But here's the problem. This whole sequence would probably take 3 to 5 minutes. And then we would have had to deal with the awkwardness of being the center of the attention on the train for the remaining 10 minutes. It would be hugely uncomfortable, with the train stopping every other minute to pick up more passengers. The embarrassment would overtake the excitement and become the focus of the story in the years to come. The busiest and most exciting crossing in the world, Shibuya was our gate way to the center of Tokyo, a place where we go almost every day to meet up with friends, find new restaurants, and have crazy nights out. It's a place full of memories and seemed perfect for the proposal. Shibuya Crossing in particular was the center of our universe. No matter what we did, we'd always start there, and come back to there at the end. There are three big TV display at the crossing on the buildings - if you've seen the poster for Lost in Translation, you've seen the one in the center - the one with the dinosaur on the poster. This idea seemed to have legs. Now I needed to make it a reality. The big TV display is one of the key components that makes the crossing so iconic and used in many films the world-over. I decided I want our pictures up there when I proposed. But how to do it? All the ads I'd seen on those TV displays were, naturally, big brands - Coca Cola, MTV, Nike. It wasn't clear how I could make this happen. My first reaction whenever I am in a similar situation is to spend hours and hours online searching for an answer. Unfortunately/fortunately, my ability to navigate the Japanese internet was severely limited by the tiny number of friends I had on Mixi (Japanese version of Facebook) and by my inability to read and type none-food-related Japanese. I had to find help outside of the Internet. At the time, for one of our projects at work, my Japanese colleagues managed an outdoor display campaign. So I asked around and found out roughly how much a smaller outdoor TV display in a less busy area would cost. It was for an hourly 5-minute spot for a few days. Not exactly the same but it gave me an idea how much this might cost - the number was quite discouraging. Nevertheless, I liked the idea and I wanted to find out more. I remembered a business man from Adobe Japan who I'd been talking to for months on a deal. We had a business relationship, but we'd also had drinks outside of work a few times (to help with the negotiation of course - that's how things work in Asia). In one of our none-business conversations I had learned that he had worked for an outdoor TV display technology company prior to joining Adobe. Perfect! As soon as I remembered this, I contacted him to see if individuals could rent out ad spaces on the TV displays, who I should contact, how long the wait was, and how much it would cost. He was excited about my plan and started making connections for me, handling all the communications with the various contacts he had. 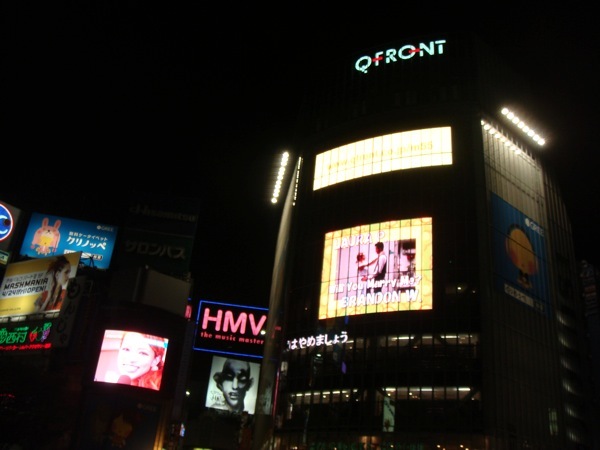 We found out that it is possible for individuals to rent these out, that the three TV displays at Shibuya Crossing operated separately, and the earliest spot available were synchronized ads that get displayed all at the same time across all three TVs. The good news was that we knew we could do it, and do it in time for the proposal (I didn't want to wait months.). The bad news - this was going to cost $10,000 (USD)! Right. "No wonder you don't see these kinds of proposals more often", I thought to myself. Even if I had the budget to do it, I knew my hopefully-fiancee-to-be would not be amused when she found out how much this had cost. But as I always believe, there must be a way. This was something that I really wanted, and I wasn't ready to accept it not being a possibility. I considered the options - maybe I could try to get just one TV at a slow time of the day/week, or shorten the air time, or find a sponsor, or... something. I asked my friend to keep looking and try different requests, and at the same time I reached out to a few Japanese friends for ideas. A couple weeks went by and things didn't progress. My options were still $10,000 for a grand show, or no show at all. And then I got a text message from a friend who I was in the Sony orchestra with. "message on TV display, FREE!" Really?! I didn't believe the words. Free to put up any thing on the huge TV display in one of the busiest intersections of the world where millions of people walk past every day? I was sure he was mistaken. But nonetheless, I couldn't help but feel a little bit excited that I might just be able to propose the way I wanted. So I called him, and he had found out that the company operating the biggest TV display at the crossing was offering a service to let people show short messages to their friends. They do this every day after 6pm, 5 minutes before each hour, until 10pm. I went to the crossing the next day at 6:50pm, waited to see if they did indeed show none-commercial messages, and he was right! All of the messages were text only and mostly happy birthday messages, but this was a good start. At the end of these messages, there was the contact info for the company offering the service and I quickly jotted it down. My friend helped me communicate with the company in Japanese the week after, and asked if they could put a photo background with a text message over the top, were okay with a proposal message in English, and we then scheduled a date that worked perfectly. I sent in the final request, photo, and everything else they requested. We were good to go! A personal message with a photo of me and my fiancee-to-be on a big outdoor TV display at one of the most famous intersections of the world, all at the cost of free. Of course, no amount of planning was enough to prepare me for the actual moment. I downed a beer at a convenience store three blocks away from the crossing, tricked my confused lady to look at the ads on the TV display while I was waiting, got down on one knee when the photo and message appeared on the screen. The world stopped for a moment until she read the message, noticed I was kneeling on the floor, and screamed. I used to drive past this huge billboard ad in downtown San Francisco when I commuted from East Bay to EA in Redwood Shore. On the billboard was Mohammed Ali in the ring with the words "Impossible is nothing." Maybe I was conditioned by this, to believe that wherever there is a will, there is a way. It's a theory that can't be proved, but in my experience, if you look hard enough there is always a way. Always. Probably why my now-wife calls me the "Yes-man".